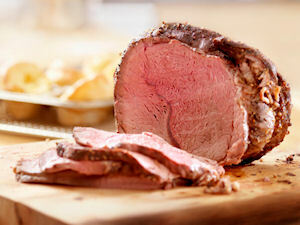 A classic and easy beef roast with a horseradish sauce makes any holiday meal memorable. Marinate a prime rib roast in Italian dressing and bake to perfection. Serve with a mayonnaise and horseradish sauce for an easy and memorable dish that will make any meal perfect. Place meat in large glass dish and sprinkle with pepper. Pour Italian dressing over meat and cover. Marinate in refrigerator for 1 hour. Preheat oven to 325 degrees F. Remove meat from marinade and place in shallow roasting pan. Bake 2 1/2 hours or until meat thermometer inserted into thickest part of meat registers 135 degrees F. Remove from oven; cover and let stand 20 minutes. In small bowl combine mayonnaise and horseradish. Serve sauce with meat. Back to the Beef Recipes home page. What would you rather eat?